Here is your chance to win a double pass to Sweeney Todd at Her Majesty's Theatre, Melbourne on June 22nd at 7:30pm, valued at $200. Sweeney Todd will be presented for six shows only in both Sydney and Melbourne from 13 to 23 June to celebrate the 40th anniversary of Stephen Sondheim and Hugh Wheeler's ground-breaking musical thriller that transports audiences into the atmospheric underbelly of 19th century London. 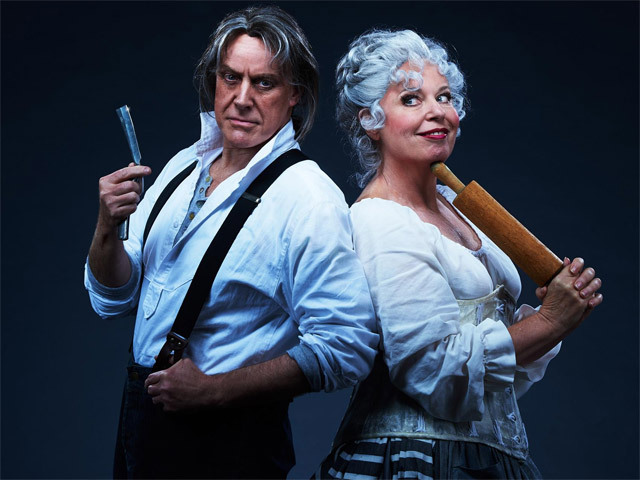 Exiled barber Sweeney Todd will be played by quintessential leading man Anthony Warlow and the incomparable Gina Riley plays the tragi-comic role of pie-maker Mrs. Lovett. With soaring arias of vengeance and yearning, the darkly-comic Sweeney Todd: The Demon Barber of Fleet Street combines the vocal power and sweep of opera with the aching humanity of musical theatre. The story, inspired by a tale serialised in a Penny Dreadful in 1846-47, centres on the unjustly exiled barber who returns to London seeking vengeance against the lecherous judge who framed him and ravaged his young wife. The road to revenge leads to Mrs Lovett, the proprietor of a failing pie shop, above which, he opens a new barber shop. Desperate times lead Sweeney Todd to plot diabolical schemes against those who have wronged him.